My daughter turned 3 on Tuesday. I’ve spent the past 4 weeks or so planning a birthday party I didn’t plan on having. We’d anticipated one of three scenarios for her birthday: a miserably pregnant & immobile mother in the June heat, hospitalization at 30 weeks, or babies in the NICU that would require our attention. All 3 things wouldn’t allow much of a party for our toddler…but we rationalized this problem by thinking she wouldn’t remember this birthday anyway. Obviously none of these scenarios is what ended up happening so instead I planned a party. A party with all her cousins from Oklahoma and her best friends from school and all the fun things she wanted. I spoiled her with ice cream and/or chocolate milk all weekend and bought her the toy from Target she doesn’t need but I thought was cute. 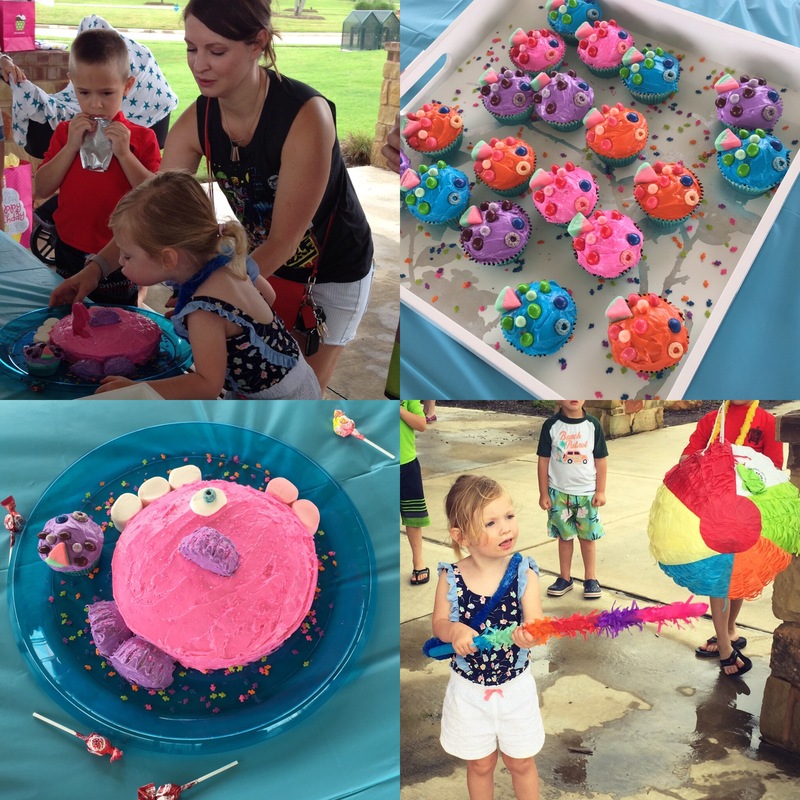 I made the only thing she actually asked for on her birthday, a “pink fishy cake” and soaked up all the love and fun a three-year-old birthday party has to offer! My daughter Campbell is the greatest gift I could ever imagine. She is keeping us afloat with her adorable thoughts, frustrating tantrums and loving hugs and kisses. The past 3 years with this girl have flown by and I’m so grateful for every second with her…but will still allow myself to complain when she’s full-blown screaming on the floor because SHE wanted to flush the toilet. I’m proud of her for taking care of me (the girl literally held my hair back when I was vomiting from morning sickness) and for being such an amazing big sister. I’ll always be sad she won’t get to hold Holly & Madeline but I’m hopeful for a time she’ll get to enjoy all the fun of being a big sister, if a little later than planned. She won’t remember this time or get much credit for her role in our healing but I’ll never forget. She made me a mommy for the first time and she continues to challenge and surprise me every day. I can’t wait to see what she does this next year and what she’ll bring to our family. Happy birthday my sweet Campbell! !